I have been working on the development of measurement technologies and hardware implementations for the detection of gravitational waves, and in particular for the Advanced LIGO project. 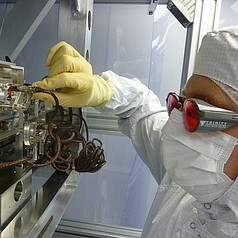 These systems are predominantly based around optical laser interferometry. Currently my focus is on the development of sensors for low-frequency gravitational force signals due to seismic and atmospheric disturbances, as well as the development of new technologies and implementations to further improve the performance of current and future gravitational wave detectors. At the LIGO Hanford Observatory I commissioned the first 4km optical cavity to test the arm length stabilisation system. I designed and managed the delivery of 30 Tip-Tilt small optic suspensions to Advanced LIGO, now used to direct the laser beam onto the photodiodes which register the gravitational wave signals. I am the chair of the Australian Consortium for Interferometric Gravitational Astronomy (ACIGA). I am a committee member of the Multi-Messenger Astronomy Advisory Committee (MMAAC) which advises multi-messenger astronomy matters to the board of Australia Astronomy Limited (AAL).